We are a group of volunteer drivers who provide transport for those who have difficulty in getting to the Health Centre or the Chulmleigh Dentist. Opening Hours: Monday- Friday 9.00-12.00 & 12.00-17.00. Charges: £2.00 per return trip within Chawleigh & Chulmleigh. Notice required: 48 hours minimum, 1 week maximum. Additional information: If necessary Escorts may travel at no extra cost. Telephone: 01769 581042 between 8:30-10:00 or 16:30-19:00. Alternatively 01769 581114 or 01769 580727. Volunteer drivers are always needed and calls are fairly infrequent. Expenses are paid. If you can offer help, please ring 01769 581234 or 01769 581114. Lapford Voluntary Car Association (LVCA) is a registered charity, governed by a very small committee, with a team of 12 volunteer drivers on its books. We cover Lapford and Nymet Rowland parishes. Passengers pay simple fares for trips to the hospital, a doctor or a dentist. £5 return to Crediton, Bow, Chulmleigh or Winkleigh, £3 to Morchard Bishop. We will also collect medication from pharmacies, deliver samples and carry out any other medical-related journeys. Jenny Gray is the Booking Co-ordinator and is available Monday-Friday 9:00am - 5:00pm by calling 01363 83099. LVCA expect at least 2 working days notice for a booking. For more information please click here. 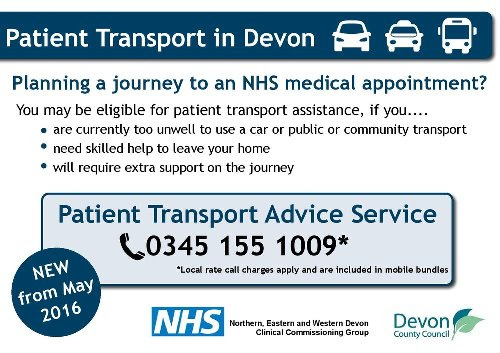 The Crediton voluntary car scheme is for helping people get out and about. Telephone 01363 773303 or click here for more information. 71a High Street, Bideford, EX39 2AA. Opening Hours: Monday to Friday 9.30-12.30. Charges: 40p per mile (including dead mileage). Notice required: Minimum 48 hours. Additional information: Escorts may travel if necessary. Patients must have no method of transport. 1 East Street, South Molton, EX36 3HR. Opening Hours: Office open Wednesday afternoons between 14.00-16.00. Charges: 35p per passenger mile. Notice required: As much notice as possible. Additional information: Escorts may travel at no extra cost. 1 Litchdon Street, Barnstaple, EX32 8ND. Opening Hours: Monday- Friday 9.00-17.00. Charges: Within 5 mile no charge, over 5 miles 38p per mile. Notice required: Minimum of 78 hours. (Subject to volunteer availability). Do not provide long journeys.